Wash sweet potatoes, and place on a baking sheet; prick with a fork. Bake at 400° for 1 hour or until almost tender. Remove from oven. Let stand 45 minutes or until cooled. Meanwhile, peel and core apples. Slice apples into 1/3″ thick wedges; toss with lemon juice in a bowl. Peel cooled potatoes, and slice 1/3″ thick. Arrange potatoes and apples alternately in a greased 13″ x 9″ baking dish. Pour remaining lemon juice over potatoes and apples. Combine brown sugar and next 6 ingredients in a saucepan, stirring well. Bring to a boil over medium heat, stirring occasionally; boil 2 minutes or until slightly thickened. Pour glaze over potatoes and apples. Bake, uncovered, at 400° for 30 minutes. Remove from oven; baste with glaze in bottom of dish, and sprinkle nuts across top. Bake 14 to 15 more minutes or until apples look roasted. Baste with glaze just before serving. Sue Bee Honey Pecan Pie – Please invite me over if you make this one! We hope that you can find a new dish to get excited about within the links above. As always we’d love to help you with your honey-related needs and remember; be thankful for the bees! Hey all, sorry for the radio silence. We’ve been working hard at extracting honey and getting everything bottled up and ready to sell. We will be selling 1 and 2lb bottles of honey again, as well as some comb honey in glass jars, and assorted beeswax candles. I have a good number of tea lights and 1oz beeswax bars ready to sell, and have been working on getting votive candles ready as well. Outside of direct sales we’ve decided to expand to selling at the Harvey County Farmer’s Market here in Newton, and I’ll be there this Saturday morning (August 25th) to hopefully supply you with some local honey or beeswax if you have need. Even if you don’t want to buy anything we’d love to have you stop by and chat, so don’t be strangers! There are other good vendors at the market as well, so come on down to 121 E. 6th Street in Newton! Some other exciting news is that we’re looking at expanding into selling in retail spaces. We’ve done a lot of learning about what we need to do to meet the requirements for third-party sales, and are working on getting our Food Processors’ license. I hope to be able to announce some exciting partnerships with local businesses in the next 6 months or so. Sugargrove Apiaries has been a rather informal venture for Ken and I so far, but this may be the point at which the business needs to be set up more formally, so you may see Sugargrove Apiaries, LLC around the area soon. 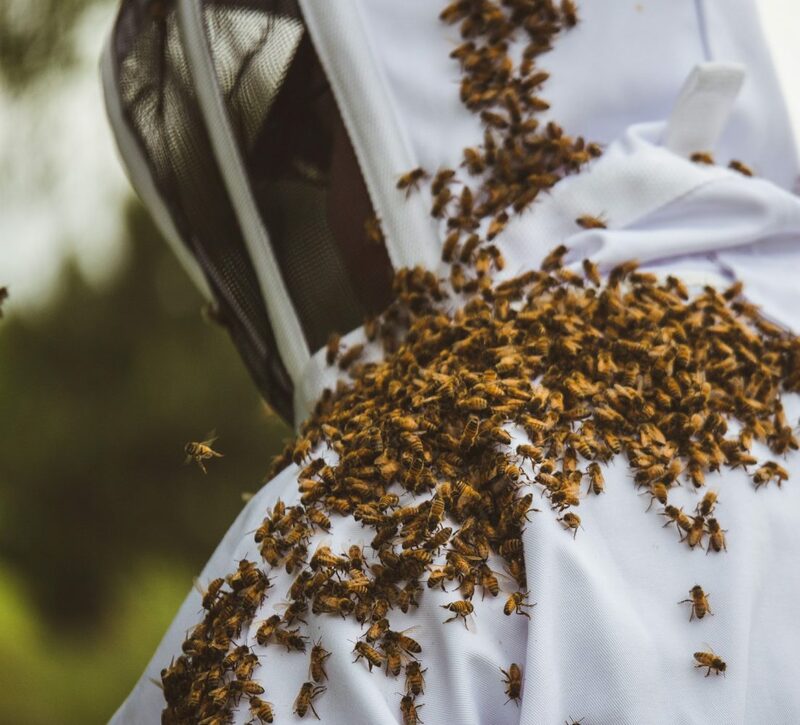 LLC or not, we’ll continue to strive to do a better job of taking care of our bees, providing quality local honey for the community, and generally evangelizing for pollinators wherever we can. Thanks, as always, for all of your support and patronage to our business. On the Hunt for Swarms! Though spring is getting off to a slow start here in South-Central Kansas we are quite excited about beekeeping again this year! Winter left us with some mixed feelings, as we lost three of our hives, bringing us down to just five at this time. These remaining hives look strong and we’re hopeful that they’ll produce well this year. However that does leave us with fewer hives than we’d like and we’re hopeful that you, dear reader, might be able to help us out with that. Two years ago we caught thirteen wild swarms of bees, while last year we only managed to capture three or four. We’d love to recruit you to be our eyes and ears this season and let us know if you see or hear of any wild swarms in your area that aren’t already claimed by another beekeeper. For your assistance you can count on some sweet repayment of honey from our hives. So what do you look for? And why are the bees swarming in the first place? I also found a video that shows a swarm nearby its original hive. So if you’re willing, please keep an eye out around your property and in the places that you frequent this spring and summer. If you see a swarm please let us know by emailing sugargrove.apiaries@gmail.com or calling/texting us at (316) 804-8765. We very much appreciate your assistance in rebuilding our apiaries! Aside from swarm hunting I (Ryan) have been trying to find time to work with our backlog of beeswax and refine it into some usable products, as well as search for some other marketing opportunities. There may be a solar wax melter in our future. Ken has set up a queen castle and is attempting a new venture of making lots of nucs and splits this year, but that’s a story for another time. We’re mulling over the idea of attending the farmer’s market here in Newton for the first time this year, and if you feel strongly that we should, please let us know! There’s still honey available! Will you be around for Fall Fest? Will you be around for Fall Fest at Bethel College this weekend? If so, we will be too! Though we don’t have any official booth on the grounds, I (Ryan) live quite close to the college and am happy to meet up with you to deliver some honey. Just drop us a line by email or phone/text (316-804-8765) and we’ll figure something out. We now have comb honey for sale in some cute jars. $10 for a sweet experience many people haven’t had! Regardless of whether or not we see you or do business this weekend, we hope you’re doing well and have a wonderful Fall! Customers and friends, sorry we’ve been out of touch for a while. Ken and I have had a very busy year so far. Apart from normal day jobs and responsibilities, some significant life events have occurred for both of us; I got married in March and Ken’s oldest daughter was married in June as well, so we apologize that we haven’t kept you up to date on our beekeeping activities this year. We’re still here, however, and have had some good success with our hives so far. We currently have 11 hives in three locations around Harvey and Marion county, and we anticipate pulling honey from 5 or 6 of them. You may be wondering when you can buy honey from us; the answer is soon! We’re actually planning on pulling supers from hives at the end of this week and extracting honey on Saturday! After this weekend we will be selling honey (hopefully) at the Harvey County Farmer’s Market on Tuesdays and Saturdays, or directly to you outside of market times. Feel free to send a message here, on Facebook, or to our email if you’d like to purchase some honey and we’ll figure out a way to get it to you. We’ll be selling 1lb bottles for $7 and 2lb bottles for $14 again, with the possibility of comb honey for $12/package depending on our harvest this weekend. Thanks for your continued support; we really appreciate it! P.S. I’ve taken some photos and videos during some of our work this year, which you can check out on our Facebook page. Let us know if there’s a process you’d like to see documented or are curious to know more about! We at Sugargrove Apiaries had the honor of providing some wedding favors for the Regier-Peachey wedding this last weekend! A big congratulations again to the happy couple!